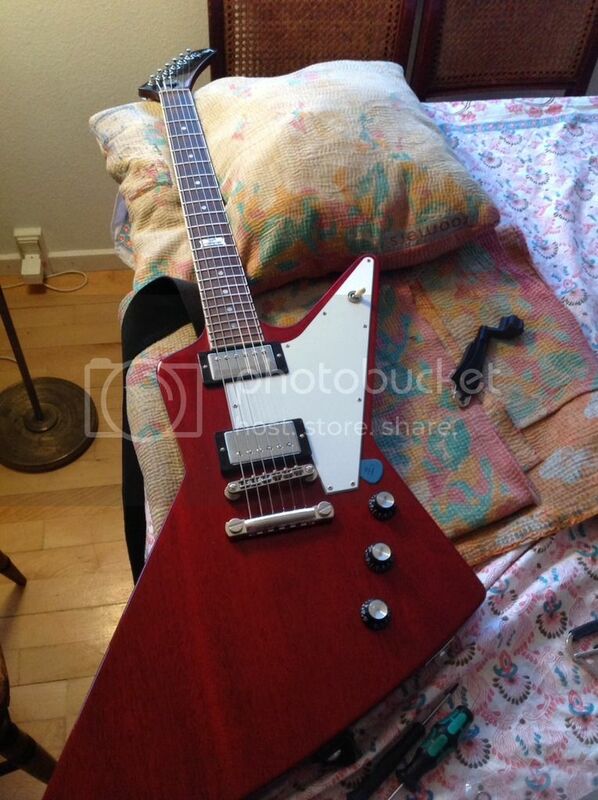 Faber Master Kit on Gibson Explorer 120 - short and ranty review. Discussion in 'Guitars in General' started by Daka3, Dec 7, 2016. Couldn't abide by the Nashville bridge on my new Explorer 120. (Yeah, I know. No NGD thread, but I don't have the time for these things always) The Nash seems plinky to my ears and I never could stand the look. Yeah, shallow, I know, but that's how I roll. Anyway - ordered a Faber Master Kit from Amber Guitars in Northern Ireland, which turned out to be a great retailer, by the way. Prompt delivery, great pre-sales communication, no tax bullsh*t.
So - yesterday, I yanked out the old Nashville insert bushings. By no stretch of the imagination will I consider myself a technically adept person, but de-installation and installation of the new studs, bridge and tailpiece was a complete breeze. Literally took me minutes. Faber includes three different stud washers for the tailpiece, and you can lock everything down real solid for maximum coupling between the parts and the guitar body, and pinpoint the exact height of your tailpiece. This makes a difference in string tension and affects playing feel. You can nail the tension you want, while retaining full contact between parts and body. Everything is super solid. mrfett, eigentone and HoboMan like this. Cool, but where's the ranty bit? All my rants are somewhat ranty, but maybe not that ranty, it seems - and thank you. I dig it. I always wanted en Explorer, and now I've got one! More like a rave than a rant, really. I replaced the bridge and the tailpiece studs on my 1980 Tokai Reborn Old LP-type with Faber parts and they brought the tone into focus just wonderfully. Love 'em. I've got Faber on 4 of my Les Pauls. Good stuff! You might want to change the title of your thread. I thought you were going to rant against Faber not rave about them. Faber is top notch all the way! EDIT - I just looked up rant and rave and it appears they are synonyms. However, in the U.S. I think most of us think of rant as negative and rave as positive - just another way we've screwed up the language. mrfett and Daka3 like this.